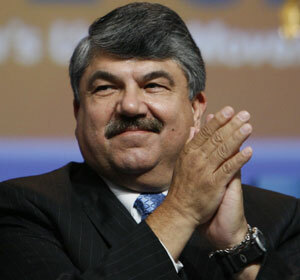 A talk with AFL-CIO president Richard Trumka on the state of the labor movement and plans for the future. On September 9 AFL-CIO president Trumka dropped by The Nation to discuss the state of the labor movement today—the challenges unions face in this economic climate, their relationship to political parties and why it's so important that progressives not forget about the principle of collective bargaining. AFL-CIO president Richard Trumka got his start in the labor movement in the coal mines of Pennsylvania, where he led 1989’s famous nine-month strike against the Pittston Coal Company during his tenure as the youngest president of United Mine Workers. Since that time, the increasing casualization of the workforce and declining industrial production have dramatically altered organized labor’s role in the American political landscape. On September 9 Trumka dropped by The Nation to discuss the state of the labor movement today—the challenges unions face in this economic climate, their relationship to political parties and why it’s so important that progressives not forget about the principle of collective bargaining.